Established in 1965, Harpeth Hills has been dedicated to providing the families of Middle Tennessee the most beautiful and peaceful setting for their loved ones memorialization. In January 1965, Co-Owners/Founders Ed Phillips, Dave Boyd and Wayne Gassner opened Harpeth Hills. On June 23, 1965, country singer Ira Louvin becomes Harpeth Hills’ very first interment. From 1970 to 1975, the cemetery grows steady. The Prayer Mausoleum, Last Supper Mausoleum, Everlasting Life Gardens, Gethsemane Gardens, Good Shepherd, Prayer Gardens, Sermon on the Mount Gardens are developed. 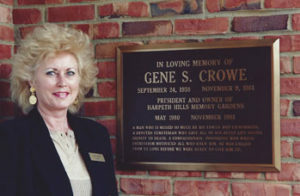 In 1979, Harpeth Hills was sold to Gene and Laurel Crowe and is still owned by the Crowe family today. In 1984, Sales Manager Bill Gregory is promoted to General Manager. In 1990, Harpeth Hills Funeral Home opens with a ribbon cutting ceremony with Manager Hank Spikes. In 2006, the Bell Tower and private walled estates were developed along with Serenity Garden, Fountain Garden, 6-Crypt walk-in mausoleum, hedge estates. In 2011, the stone pillars and railings were added along the front entrance. The Pavilion at Harpeth opens to the public for receptions and life celebrations. In 2014, the Veteran’s Memorial was developed at the entrance of the cemetery. We are proud of our heritage as we continue to serve the families of middle Tennessee.